Last Saturday Todmorden Harriers were out in force to compete in the local classic: The Wadsworth Trog. 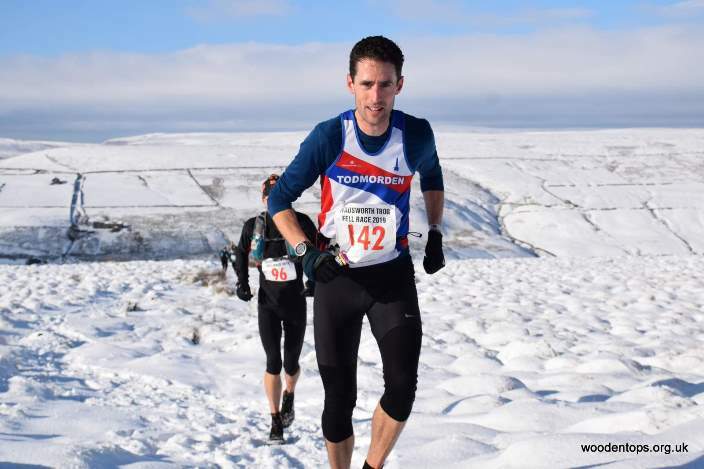 This beast of a race sets off from Old Town, up to High Brown Knoll and then over to Top Withins in Haworth and down to Walshaw. The sting in the tale is the final climb back up to High Brown Knoll and over to Sheepstones. It is over 19 miles with 3,600 foot of climb. This was the first fell race in the Tod Harrier’s Grand Prix and twenty five Toddies turned out, all wrapped up to brave the freezing snowy conditions and well fuelled by the free cakes provided en route. The beautiful sunny conditions soon lifted spirits and there were even instances of sunburn! Jack Wood of Ilkley Harriers won the race in 2:35 and the first woman was Sharon Taylor of Helm Hill in 2:59. The first Toddie back was Graeme Brown in 3:00, eighth overall. Three minutes behind was Andrew Worster, followed closely by Paul Hobbs in 3:05 and Nick Barber in 3:08. Rebecca Patrick was first Tod lady back, fourth lady overall in 3:37 and first V40. Melanie Blackhurst finished in 3:48 and took the V50 prize. Rebecca along with Melanie and Kate Mansell 3:55, took the women’s Team Prize. Graeme Brown 3:00, Andrew Worster, 3:03, Paul Hobbs 3:05, Nick Barber 3:08, Chris Goddard 3:15, Dan Taylor 3:17, Dom Leckie 3:24, Darren Tweed 3:24, Rebecca Patrick 3:37, Duncan Ritchie 3:38, Ben Holmes 3:41, Robert Halstead 3:44, Melanie Blackhurst 3:48, Roger Haworth 3:52, Stuart Wolstenholme 3:54, Kate Mansell 3:55, Lucy Hobbs 3:58, Pauline May 3:58, Zoe Dijkamn 4:05, Paul Brannigan 4:07, Robert Holdsworth 4:11, Robin Gray 4:21, Simon Anderton 4:25, Kim Ashworth 4:34, Elise Milnes 4:44.